We went to the Montgomery Inn Boathouse last night for dinner and I noticed they had a house brew, or at least that’s what it appeared to be. The menu listed this as Montgomery Inn’s Ted’s Pail Ale. 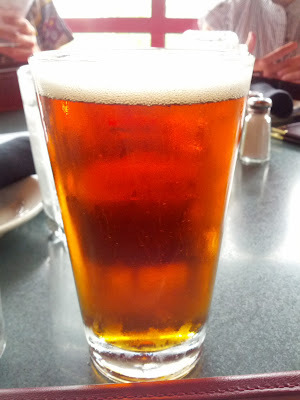 The internet has revealed this to be Lenenkugel’s Special Ale, basically a special brew by Leienenkugel sold at various restaurants under “house” brands. Also the boathouse had NO Cincinnati breweries, very dissapointing to me. I would hope such a famous and notable Cincinnati restaurant would help support local brewers more. I’m sure Mt. Carmel, Rivertown, or Moerlein would be willing to whip up a special brew for the Montgomery Inn. Anyway, enough griping about deceiving labeling, onto the review. This comes out looking great. Nice brown color with plenty of amber hues and a small topping of fluffy white head. It smells malty with hints of caramel and a bit of hops. The taste strongly reinforces that smell with more sweet malts though the same amount of bitter hops. It’s a very smooth and balanced taste. The mouth feel is light bodied with no carbonation, again very nice. Overall this is a great highly sessionable beer that I’m happy to give a 4/5 rating.